Herbalists view dandelion as a valuable plant with important medicinal uses. Dandelion roots stimulate appetite, and may help with digestion as well as with liver, gallbladder and kidney function. The leaves have diuretic effects and the flower has antioxidant properties. You can drink dandelion tea for these purposes. Although dandelion is generally not associated with any dangerous effects, the University of Maryland Medical Center recommends taking herbs only under the supervision of a health-care provider. Some people are allergic to dandelion and can develop skin inflammation and itching from touching this plant, according to the UMMC. Taking oral preparations such as tea can cause mouth sores for anyone allergic to dandelion. If you are allergic to chamomile, chrysanthemums, daisies, feverfew marigold, ragweed, sunflower or yarrow, you should not drink dandelion tea. Anyone allergic to iodine or latex also should avoid dandelion preparations. The UMMC notes that an allergy to dandelion, as with many other herbs, could lead to a dangerous anaphylactic reaction. Dandelion can cause unpleasant gastrointestinal effects, according to the U.S. National Institutes of Health at its MedlinePlus website. Some people may experience increased stomach acid and heartburn, upset stomach and diarrhea when taking dandelion. 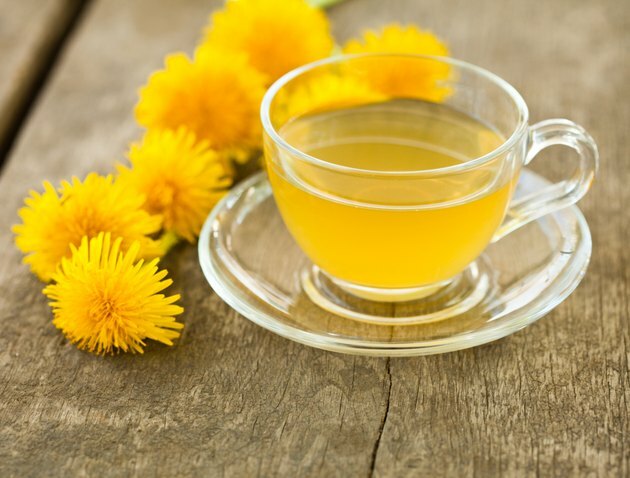 Avoid drinking dandelion tea if you need to take antacids or other medicines to decrease stomach acid. Because dandelion interacts with some drugs, the UMMC recommends consulting your health-care provider before using dandelion preparations if you take any prescription medications. The diuretic effects of dandelion can lead to increased excretion of certain medications. Research with animals indicates that dandelion may worsen side effects of lithium, which is used to treat bipolar disorder. One species of dandelion, Taraxacum mongolicum, or Chinese dandelion, may reduce absorption of quinolone antibiotics such as ciprofloxacin and levofloxacin. Taraxacum officinale, the common dandelion, could have the same effect. Animal research shows mixed results on whether dandelion lowers blood sugar, according to MedlinePlus, and the effect of this herb on blood sugar in humans is unknown. People prone to low blood sugar should be cautious about taking dandelion, and so should anyone taking medications or herbal remedies that reduce blood sugar. Dandelion leaf contains coumarins, chemicals which increase the risk of bleeding. Dandelion could increase bleeding when taken with other substances with similar effects, explains MedlinePlus. Some examples include aspirin, nonsteroidal anti-inflammatory drugs such as ibuprofen, anticoagulants such as warfarin and heparin, and antiplatelet drugs such as clopidogrel.